Bellevue Arts Fair Weekend takes center stage in Downtown Bellevue this Friday, July 28th through Sunday, July 30th, 2017. Each year, the Bellevue Arts Fair Weekend draws in more than 300,000 attendees to Bellevue over the 3-day arts and crafts celebration. This extensive guide will lay out some tips to navigating through the city during this busy weekend and also provide the necessary resources to plan your perfect weekend getaway in Bellevue, Washington. The Bellevue Arts Museum plays host to this award-winning arts & crafts festival in the Pacific Northwest. With a commitment to quality, handmade excellence, BAM ARTSfair supports designers, artists, and craftspeople at the local, regional and national levels. With over 300 inspiring artists showcasing their unique, handcrafted works, BAM ARTSfair represents an eclectic mix of modern, traditional, and emerging artists, craftspeople and designers. Since 1947, BAM ARTSfair has been the annual gathering place for creators and community members and serves as a great way to connect to the world of art, craft & design. Celebrating its 33rd year in 2017, The Bellevue Festival of the Arts features 200 of the most talented and popular artisans, musicians and craftspeople from the greater Pacific Northwest region and beyond. Produced by the Craft Cooperative of the Northwest, the festival is entirely organized by artists and supports a variety of local and global non-profit organizations with proceeds from the festival. The Bellevue Festival of the Arts remains a committed community partner and works with various local educators and features local non-profits in the festival. 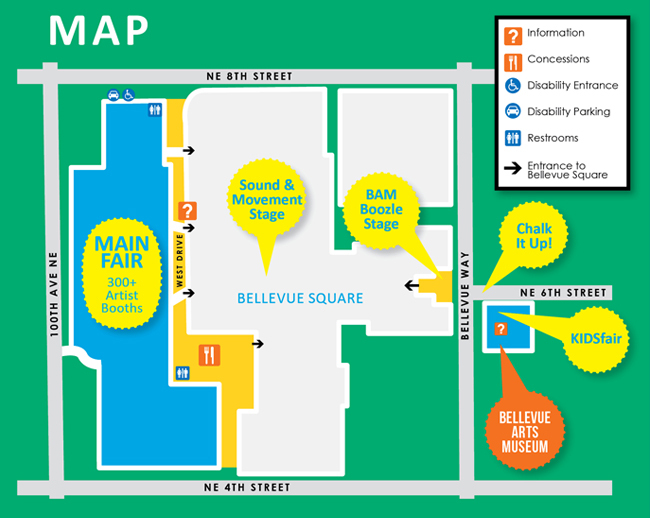 Produced by the Bellevue Downtown Association, Bellevue’s 6th Street Fair showcases the original work of over 100 artists of sculpture, jewelry, wood and glass work, home décor, fabrics and more. Various brick-and-mortar restaurants and food trucks are located in close proximity to the fair. 6th Street Fair is located next to the Bellevue Connection and Compass Plaza along NE 6th Street and 106th Avenue NE. Looking for a quick bite to eat between events? Or maybe a formal, sit-down restaurant when the night winds down? There are hundreds of restaurants in downtown Bellevue and much more across the city ranging from casual sandwich spots to 4-star chef owned restaurants and well known national chains. Bellevue, Washington’s hotel accommodations include more than 5,500 guest rooms with options from luxurious 4-star downtown hotels to peaceful suburban retreats. Hyatt Regency, Westin, Hilton, Sheraton, Courtyard by Marriott, Marriott Residence Inn and Seattle Marriott Bellevue are among the major hotel brands from which visitors can choose.